Venus of Lausell, Lausell goddess, venus, goddess statues, Lausell. The original is 17 inches tall and was found in the entrance to a cave that was both a dwelling place and a ceremonial site. She was painted red, the color of life, blood and rebirth. 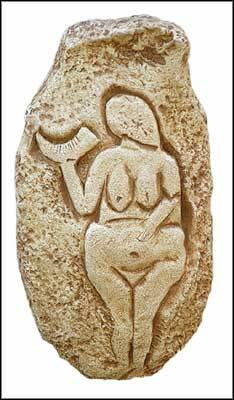 Paleolithic sculptors chiselled her out of limestone with tools of flint, and gave her to hold in her right hand a bison's horn, crescent-shaped like the moon,which is notched with thirteen marks representing the thirteen days of the waxing moon and the thirteen months of the lunar year. With her left hand she points to her swelling womb. Her head is tilted towards the crescent moon, drawing a curve of relationship from her fingers on the womb up through the incline of her head to the crescent horn in her hand, so creating a connection between the waxing phase of the moon and the fecundity of the human womb.